The pop-up at The Conduit members-only club in Mayfair, London. Since launching in 2011, ethical-luxe NYC fashion label Maiyet has brought us a new type of luxury by working directly with global artisans. 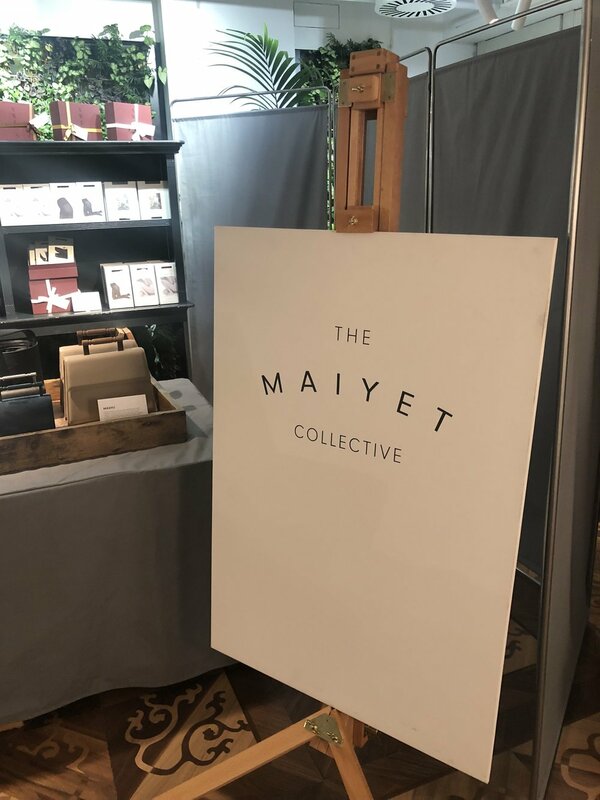 And now Maiyet has launched a landmark part time concept store, The Maiyet Collective, which is housed within The Conduit – a new social ethics-focused members’ club that brings together NGO leaders with philanthropists in London. Open for only three days each month, The Maiyet Collective pop-up will offer a range of sustainable luxury and positive impact brands on rotation. We attended the private view to see November’s brands, among them Carmen-backed Sana Jardin, as well as SDress, Birdsong, ELEVEN SIX, and Côme Éditions. SDress, a London-based seasonless womenswear label that focuses on adaptable, durable pieces. Founded by Sanja Vukelic, the pieces that make up SDRESS collections are multifunctional, low maintenance, and environmentally friendly. The collections themselves are seasonless, and Vukelic stresses the importance of ease: all pieces are machine washable, free of zips and fussy buttons, and do not require ironing. They give the term “thrown-on-and-go” a whole new meaning. SDress items are ethically produced in Italy with eco-certified fabrics that have been created in a carbon-neutral non-toxic, water-saving process that has been endorsed by the WWF. London-based brand Birdsong produces knitwear handmade by older isolated women. 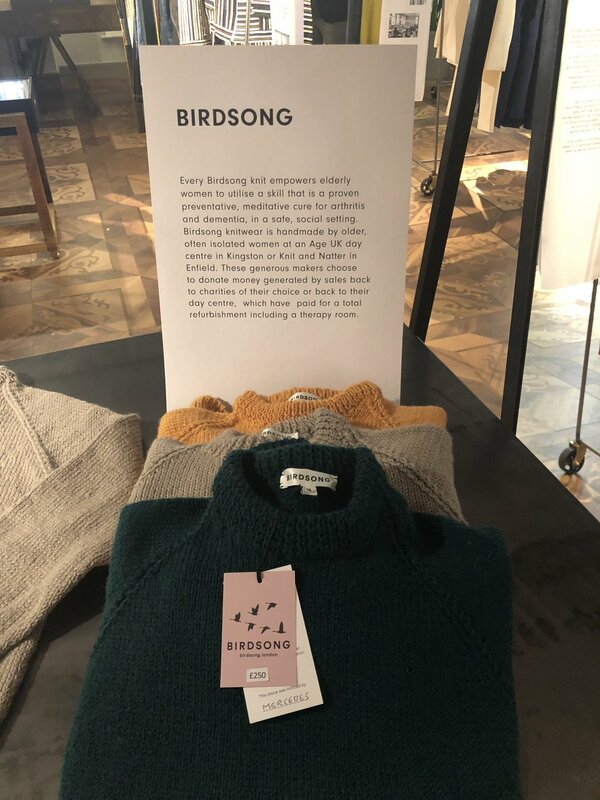 Another brand that caught our eye was Birdsong, which empowers elderly women to knit because it has been proven to be a preventative, meditative cure for arthritis and dementia. The women, who are either at the Age UK day centre in Kingston or Knit and Natter in Enfield, use the money generated by the sales to pay for refurbishment of their centres and improve living conditions. The brand empowers elderly women - a rather neglected group - even in the social impact space. Another brand on our radar was ELEVEN SIX, which has contemporary tunics and dresses inspired by the traditional Andean knitting techniques of Peru. Every piece is handcrafted in limited quantities. Catherine and Nick, the British couple behind the label, chose to follow their hearts in pursuit of their true passions after a trip they took to the Sacred Valley of the Incas in Peru. Catherine then made the decision to leave her career in corporate fashion. ELEVEN SIX is a women's knitwear brand designed in New York and sustainably produced in Peru and Bolivia by artisans. Championing the customization route, and demonstrating that there are many ways to be ethically minded, Paris-based Côme Éditions allows customers to create a jacket with personalized designs and slogans. Each uniquely customized piece is made in Paris and embroidered by a collective of women facing difficult situations at Senegal’s La Maison Rose charity. 20% from each customized Côme Éditions piece is donated to La Maison Rose charity in Senegal. We look forward to discovering more sustainable brands at The Conduit. Maiyet co-founder Paul Van Zyl, who works at the crossroad of design, luxury and ethics, told Wallpaper: “The fashion industry is the almost perfect fusion between complexity and creativity. It has the ability to uplift and inspire, yet it’s the world’s second most polluting industry, therefore it has a remarkable opportunity to move from a bad actor to something that has a positive impact on both people and the planet.” Hear, hear. This month’s pop-up is on the 2nd and 3rd of November from 10am to 8pm at The Conduit Club, 40 Conduit Street, London, W1S 2YQ. Non-members are encouraged to RSVP lily@maiyet.com.